The Drupal community has updated their developer tools and workflows for building new projects - and so should you. A 2-day adventure with hundreds of marketers at the State of Search. Read all about the sessions and experience of attending the conference. 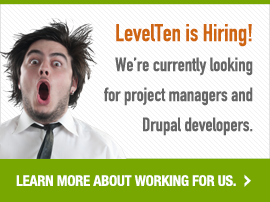 Read our summer intern Brandon's learning experience as a Drupal developer for LevelTen.